[Extract] Now in its 15th year, the competition was particularly tight, with event organiser, Niche Media, receiving 533 entries – a record number. 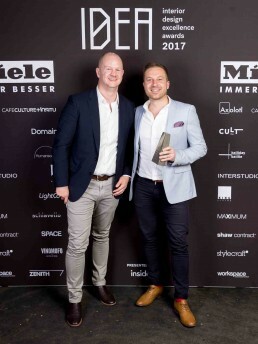 The program celebrates the best of Australian interior and product design across 14 categories and five special awards. Testament to the quality of entries, this year more than 250 projects were shortlisted. Read a recap of the night here. View the winners, highly commended and shortlist here. What a way to end awards season! A few words from the studio… Congratulations to all the winners, highly commended and the shortlisted studios. We are extremely humbled and proud to be recognised in an industry with such a high calibre of talent. We’d like to thank our valued clients, friends, family, trusted network and consultants for all the love and support over the last 5 years, we simply cannot thank you enough and can’t wait for the next 5! Thanks to Niche Media the event organisers, and all the sponsors on successfully bringing the industry together once again. It’s great to be part of such a supportive and ever evolving industry. The night also awarded us High Commendations for our Gwynne St Studio and Clerkenwell Grind projects. We are forever thankful to the people around us and all the support we’ve received. Thank you very very much and we can’t wait to show you more in the coming weeks/months/years.